This week at Supercomputing, everyone is getting excited about next generation hardware, not only on x86 but also GPUs, POWER, Arm, FPGAs, and accelerators. The danger of having so many partners trying to get business for their products and discuss future generations of products is that not everything is qualified through the original manufacturers and leaks are made. This is one such leak. Intel’s major OEM server providers and partners on the Supercomputing show floor were demonstrating their next generation products. 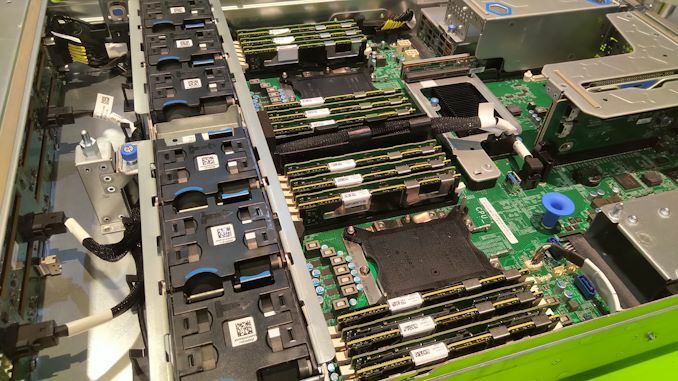 Intel’s DC Optane memory is a big part of that for certain OEMs, and as a result they were keen to show the modules on the slow floor as well as the server racks and motherboard designs. 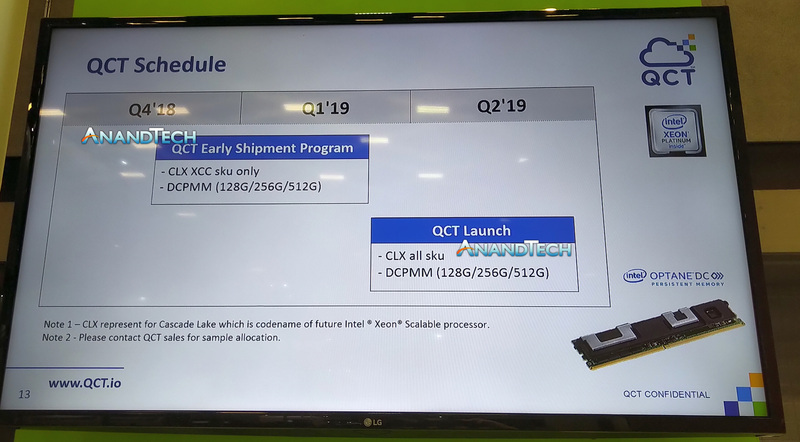 While there were no Cascade Lake processors directly visible, which are required for Optane support, on the show floor, many companies were offering demonstrations of what they intend to offer. However, we found one that actually showed the expected timescale in what looks like a confidential presentation that was accidentally put on display. We snapped this photo near the end of the show, so I'm surprised it stayed up that long. The key part of the image is the launch window, which states that all Cascade Lake-SP processors will be available between the end of Q1 through most of Q2. This is essentially a 'March to May' window, which verifies a similar report we had seen elsewhere. This is well beyond the 2018 time frame Intel announced at its DCI Summit earlier this year, however, it does look like Intel will at least ship for revenue in 2018 with the Early Shipment Program. The Early Shipment program, using only the larger XCC 28-core models, are shipping from the middle of Q4 2018, which is effectively now. This includes the Intel DC Optane Memory shipping test systems with up to 512GB modules. The company had a full Cascade Lake system at the show filled with normal memory and 128GB Optane modules, albeit without CPUs. These early shipment systems are usually targeted to customers involved in Intel’s Early Sampling Program as well. The ‘March to May’ window for the full launch as seen on the slide does throw up a few questions as to where Cooper Lake will land later in 2019 (or if it will just ship for revenue in 2019). The new Cascade Lake-SP processors will have additional hardening for architectural attacks such as L1TF and Meltdown Variant 3, although with Intel’s recent reports that it has an increased demand, it may end up being a tough time filling orders (despite selling everything that they make and making record revenues). There is no word on pricing at this time. Given Intel’s previous statements, we expect Cascade Lake-AP to also be launched in this window. I am curious about desktop and especially mobile changes coming, is there a laptop version of Cascade Lake coming. It sounds to me that Intel has been seriously working on hardware fixes for security holes. Well what is important is that Intel is seriously working and corrected the security issues in this release. In server, security is an uncompromising cornerstone. Fixing Meltdown and Spectre for Cascade Lake was the correct choice.